Witness Mannimarco's descent into necromancy in a sealed ruin on Artaeum. "You tattled didn't you? You're a greater fool than I thought." Ulliceta, an apprentice studying under the Psijics, took a powerful seeing stone called the Eye of Remembrance to the forbidden Traitor's Vault. It may reveal the secrets hidden there. Find the first library pedestal and use the eye on the bridge. Find the second library pedestal and use the eye in the presentation chamber. Find the next pedestal in the laboratory and use the eye on it. Find the fourth library pedestal outside the Sealed Hall and use the eye. Enter the Sealed Hall, explore it and defeat the Vessel of Worms. Return to Ulliceta gra-Kogg and speak with her. Talk to Ulliceta gra-Kogg or Cinucil to begin this quest. Ulliceta gra-Kogg is just outside of Traitor's Vault. You first find Ulliceta outside the Vault, cradling a strange stone and clutching her injured arm. "What? Oh, thank Malacath! I thought you were the Relicmaster! I'm not sure what brings you down here, but you couldn't have come at a better time. As you can see, I'm a little... impaired." Cinucil sent me to find you. What are you doing in this vault? "Exploring! Our betters don't like to talk about it. When they do, they call it Traitor's Vault. According to my research, it used to serve as a retreat for the Order's most talented pupils. But then, without warning, the Ritemaster barred it shut." Why doesn't he want people to enter this place? "Good question. I found this memory stone in the grand reliquary. It's called the Eye of Remembrance. Using it near the library pedestals here might show us why these ruins were sealed. You look stronger than most. How about you lend me a hand?" All right, if it will keep you out of harms way. what do you need me to do? "What luck! To find a fellow troublemaker on this stiff-necked isle. There should be pedestals scattered throughout the ruin that will cause the Eye to activate. I'll contact you through aural projection to walk you through it." Enter the vault and activate the first pedestal. A memory will play out. Projections of a younger Mannimarco and Vanus Galerion appear before you. Vanus' hair is shorter and brown instead of white. Vanus Galerion: "Just look at this place. How in Syrabane's name did you get the Ritemaster to unlock it for you?" Mannimarco: "He rightly acknowledged our superior skill. It's only natural that he'd let us work here." Vanus Galerion: "Well, it's quite a privilege." Mannimarco: "Privilege? It's our right, Vanus. You mustn't be so humble all the time." Vanus Galerion: "Oh, not this again.... Come, let's explore further!" The memory of Vanus walks further into the Vault and disappears. Mannimarco: "Secluded, cavernous- yes. This will be perfect for my research." Ulliceta gra-Kogg: "That was Mannimarco! And Vanus Galerion- leader of the Mages Guild. Can you believe this? It must be Mannimarco's laboratory!" Vanus Galerion: "What have you done? This is just... repugnant." Mannimarco: "Oh, Vanus, I would have thought you less judgemental. It's just a bit of puppetry. Nothing but arcane lift and spirit-handling." Vanus Galerion: "That was a living thing, Mannimarco. You're edging close to a dangerous line. Too close." Mannimarco: "You sound like the Ritemaster. The only lines are those you draw in your mind." Vanus Galerion: "I'm not going to.... Please, just find a new avenue of research. All right?" The memory of Vanus begins to walk away, and disappears. Mannimarco: "Oh, Vanus, you fool. You will never understand true power." Ulliceta gra-Kogg: "I always heard Vanus and Mannimarco were friends, but it seems like a complex relationship. Fascinating! Let's see what else we can find!" Find and activate the third pedestal. Vanus Galerion: "This is what happened to our classmates? What is wrong with you?" Mannimarco: "Wrong? Honestly, grow up, Vanus. There is no right and wrong- only power and weakness." Vanus Galerion: "You've made me for a fool. I can't believe I didn't see the rot infesting your soul." Vanus Galerion: "You will answer for this eventually. I swear it." The projection of Vanus disappears and the risen dead of Mannimarco's former classmates fall down dead on the floor. Mannimarco: "And you, my friend, will answer for your short-sightedness when I eclipse you in every way." Ulliceta gra-Kogg: "I always thought Mannimarco was confused. Misguided. Seems he knew exactly what he was doing. Amazing." Now find the last pedestal and activate it. It appears that Mannimarco has Vanus in a choke-hold. He's lifted Galerion off the ground and seems annoyed. Mannimarco: "You tattled, didn't you? You're a greater fool than I thought." Vanus Galerion: "You tainted the Ceporah Tower! You're worse than a murderer." Mannimarco: "Pathetic. Do you expect Iachesis to bind me here? No, he'll simply banish me from the island." Vanus Galerion: "That won't be enough. You're a beast, Mannimarco. A beast that needs to be caged." Mannimarco: "Of course you're right. And once I reach the mainland I'll show the world how right you are." Mannimarco: "Now, if you'll excuse me, I have a ritual to complete." 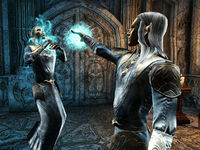 Mannimarco proceeds to hit Vanus with a blast of magic, flinging him backwards, and the projection of Vanus disappears. Mannimarco: "Now, to my masterwork. If Iachesis does not see the genius of my work, he can rot with the rest of them." The memory of Mannimarco walks into the nearby door and disappears. Ulliceta gra-Kogg: "So these are the events that lead to Mannimarco's exile. Let's keep exploring!" Enter Mannimarco's Secret Chamber. Inside the Chamber is a giant cold-fire bone colossus called the Vessel of Worms. Destroy the Vessel of Worms. Ulliceta gra-Kogg: "Well, I didn't expect that. Meet me outside. We have a lot to talk about." Meet Ulliceta back outside and speak with her to receive your reward. "Welcome back, partner! By Malacath, what a discovery! We learned about the history of the vault, the Worm King's relationship with Vanus Galerion, and you even destroyed one of Mannimarco's vile experiments! Not bad for a day's work!" We may have meddled with something very dangerous. "Don't turn on me now! The eye gave us a glimpse of Mannimarco's work. With time we might be able to learn more about his process! Know your enemy, right? I hope I can count on you to keep this a secret. Here's a little something for the effort." Right after the quest, this little scene plays out. Ulliceta gra-Kogg: "Let's do this again some time, eh?" Enulyanar: "No. You will not be doing anything like this ever again, Ulliceta." Ulliceta gra-Kogg: "Spying on us, eh? Well, I'm sick of you cowards hiding knowledge away then punishing us for discovering it." Enulyanar: "If not for adma'na like you, we wouldn't have to hide things like the Eye you stole. Come, Ulliceta. Your punishment awaits." Ulliceta gra-Kogg: "Good! I'm anxious to tell you all exactly what I think of you." Ulliceta and Enulyanar then leave through a portal. I should travel to Traitor's Vault to speak with Ulliceta. Ulliceta said there are library pedestals in this ruin which may react to the Eye of Remembrance, revealing the secrets of why this vault was sealed away. I should search for the first library pedestal and defeat any undead in my way. I discovered a strange pedestal atop a bridge deeper in the ruins. Perhaps this is the library pedestal Ulliceta mentioned. I should use the Eye of Remembrance nearby and see if the pedestal reacts. When I used the Eye of Remembrance near the pedestal, I witnessed a memory of Vanus Galerion and Mannimarco. I can feel the eye drawing me deeper in the ruins. There must be more pedestals to find. I should keep looking. I found another library pedestal inside what may be a gathering hall, or a presentation chamber. I should use the Eye near the pedestal to reveal the next memory. The Eye of Remembrance draws me deeper in the ruin. The next library pedestal is close. I must find it. The pull of the Eye has led me to what appears to be a ruined laboratory. I should use the Eye to discover the next memory. The pull of the Eye is stronger than ever. It feels like it is consciously directing me now, to what may be the memory that finally reveals why this library was sealed. I should see if I can find the fourth library pedestal. I've found what may be the last library pedestal in the ruins. I should use the Eye again. Perhaps I'll finally learn the truth about why the ruins were sealed. The Eye revealed what might have been the final confrontation between Mannimarco and Vanus Galerion. I should learn all I can, then continue on. After defeating Vanus Galerion in the last memory I witnessed, Mannimarco departed for a sealed room. Though something horrible may wait inside, I feel the Eye drawing me on. I must enter the sealed room to learn why these ruins were sealed. Mannimarco's sealed room likely contain horrors I have yet to discover. I should tread carefully as I search. An undead creature rose from a tomb in the secret chamber—no doubt left here by Mannimarco and sealed in by the Psijic Order. Now that it has revealed itself, I must destroy it. Finishes quest Ulliceta urged me to meet her outside. I should leave the vault and talk to her. This page was last modified on 29 January 2019, at 15:58.